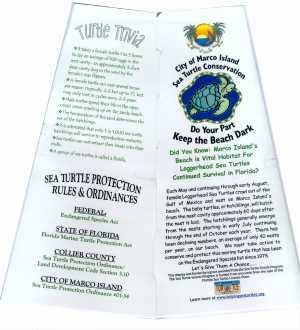 Summary: This project encompasses the development, production, and distribution of three types of educational material for seasonal, permanent and school-aged residents of Marco Island to promote the understanding of marine sea turtle biology, habitat needs for the conservation, and the protection of marine sea turtles that nest and hatch on the beaches of Marco Island. Distribution of the education material will also be incorporated into educational presentations. The first item developed will be a three-dimensional, four paneled, Table Top Tent with colorful photos and artwork on informational displays for 2,200 hotel and rental condominium rooms to educate seasonal and visiting population on Marco Island about the biology, lighting impacts, regulations and state and local contact names and numbers. The second item will be 100 colorful, glossy 11 by 17 posters located throughout the city displaying sea turtle information for the year round (and seasonal) population to review. The third item will be 1,000 sea turtle-shaped magnets with conservation, regulations and local and state contact names and numbers. This item will be distributed to approximately 900 school aged residents at educational presentation in the spring of 2005. During and after sea turtle nesting and hatching season public surveys will be conducted to evaluate the success of the educational material. Results: A decrease in lighting violations during the season is due partly to the information given to each property, the presentations given to a wide variety of groups on the island, the newspaper articles, and the letters and calls to the property managers. All of these factors contributed and still contribute to the decrease in lighting violations on the Marco Island beach in sea turtle nesting and hatching season. Several surveys this nesting season throughout May and early June, resorted in continued low numbers of lighting violations. Surveys taken on the beach indicate that residents as well asvisitors are aware of sea turtle nesting and hatching season lighting regulations on Marco Island.